Ten years ago, when audiences were familiar with Pixar (Toy Story series, Monsters Inc.) and newcomer Dreamworks (Shrek) as the major CGI animation studio houses, Blue Sky, an animated company based on the east coast, released their first major full length feature called Ice Age. The story of how an unlikely “herd” was formed by Manny the mammoth (Ray Romano), Sid the sloth (John Leguizamo), and a saber-toothed tiger named Diego (Denis Leary) was very well done. It’s premise, casting, way of storytelling & character development eventually inspired a couple of follow-up movies with Ice Age: The Meltdown (2006) & Ice Age: Dawn of the Dinosaurs (2009). 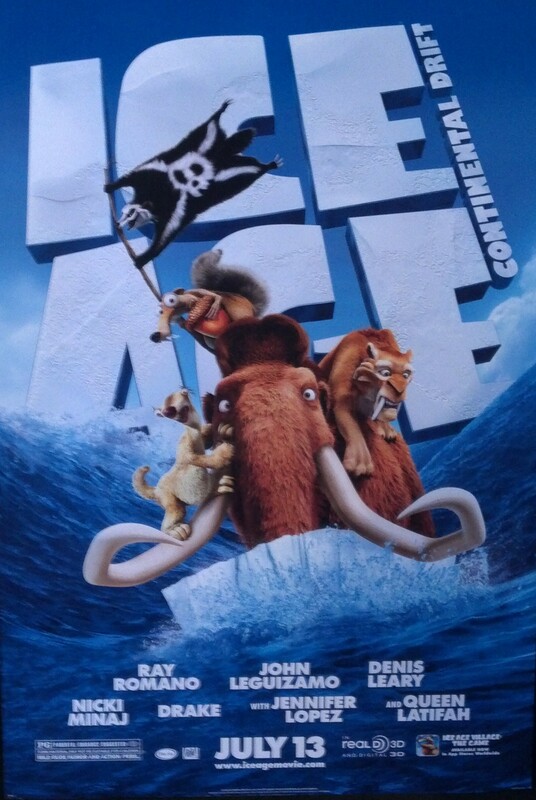 This time, the sub-zero heroes find themselves in a predicament of global proportions in Ice Age: Continental Drift. Sometime has passed since Manny & Ellie (Manny’s wife, voiced by Queen Latifah) became parents to a baby girl named Peaches. As Peaches (Keke Palmer), now a teenager, is going through the growing pains of adolescence & tired of her dad’s overprotective nature, Pangaea begins to spilt into the separate continents that we know of today. This causes a separation [a literal rift, if you will] between Ellie, Peaches, Crash & Eddie, (the possum brothers voiced by Seann William Scott & Josh Peck) and Manny, Diego, Sid, & Sid’s grandmother (Wanda Sykes) who was dropped off by Sid’s family early in the movie. In Manny’s quest to return to his family, they come across a ruthless band of pirates led by Captain Gutt, an egotistic yet dangerous Gigantopithecus [prehistoric monkey voiced by Peter Dinklage]. All throughout the movie, Manny is determined to lead the herd to back to family despite the pirates and the continuing continental shift. One thing that the Ice Age movies do really well is place the unorthodox herd in a situation which allows the characters to develop in some way. Continental Drift is no exception to that. The main motivations of the characters are so clear that this movie could be used when learning about basic character motivations within a story structure. As far as humor goes, it’s a relatively on average as far as the Ice Age movies go: plenty of chuckle moments as well as the occasional laugh out loud moment. The humor that misses for adults, the kids will most likely enjoy, as well as a few jokes that adults will understand. 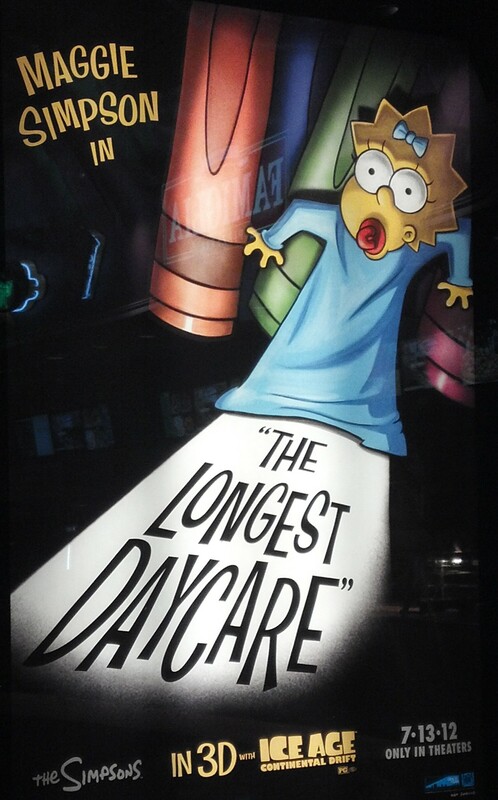 Seeing Ice Age: CD in 3D also includes this short, that SHOULD NOT be missed by ANY fan of The Simpsons. In addition to the story, the visuals/graphics in Continental Drift were very impressive. Not only were the animators able to sharpen the quality of the main characters (i.e. fur, movement, smoothness), but also the environment & objects around them. If you go and see this movie, notice the water & the apple in a scene when Granny is “feeding” her imaginary pet. It looked as if a real apple was being dropped into the water. The water effects were arguably the best ever seen in a CGI movie. While you’re probably thinking that it is ridiculous to be mentioned in a movie review, remember that this movie involves the continents splitting up. If the water effect looks lousy, then the audience is lost because of the terrible quality of the water. The introduction of new characters, while many, play their roles well in addition to serving as fodder for the comedian voiced animals (namely Ray Romano’s Manny & Wanda Sykes’ Granny) to deliver family friendly puns that work in the context of the story. I was surprised at how much I enjoyed the dynamic between Diego & Shira, (a tough as nails white saber-toothed tiger voiced by Jennifer Lopez). It surprised me how well the vocals seemed to fit the onscreen action. Since Lopez recently quit her gig on American Idol, it would not bother me to see her reprise her role as Shira in a future Ice Age movie [if there is one]. The movie’s casting choices were inspired from Aziz Ansari playing the Squint, the wise cracking rabbit aboard the pirate ship, Wanda Sykes as Sid’s crabby, snappy grandmother, to casting Drake, Nicki Minaj, & Glee’s Heather Morris, as the “popular circle” (capitalizing on their popularity among teenagers) that a now teenage Peaches (voiced by Keke Palmer, a great young actress & another popular TeenNick notable) want to be a part of. And with a cast filled with popular music acts, what would the movie be without the kid friendly collaboration song? Anyway, with a colorful cast, there is a character for everyone to identify with in this film. The slick spots in Continental Drift are spots where the story flow seems formulaic of the previous Ice Age movies. After having a crucial role in The Meltdown & finding love in a hilarious fashion in Dawn of the Dinosaurs, the story arc following Scrat (the acorn-crazy prehistoric squirrel) takes the character back a few movies where the running gag gets stale halfway through the movie. While there were a couple of appropriate placed appearances for the sake of comic relief, it feels so familiar from the first couple Ice Age movies that it’s not funny. With Scrat, less is more. The subplot featuring Peaches and the popular teen mammoths is pretty predictable. While it is predictable, when you consider that some kids have grown up with these characters, it is timely that they see this message. There are a couple of intense moments (The continent splitting, a few action scenes) but nothing that young fans of this franchise aren’t used to.